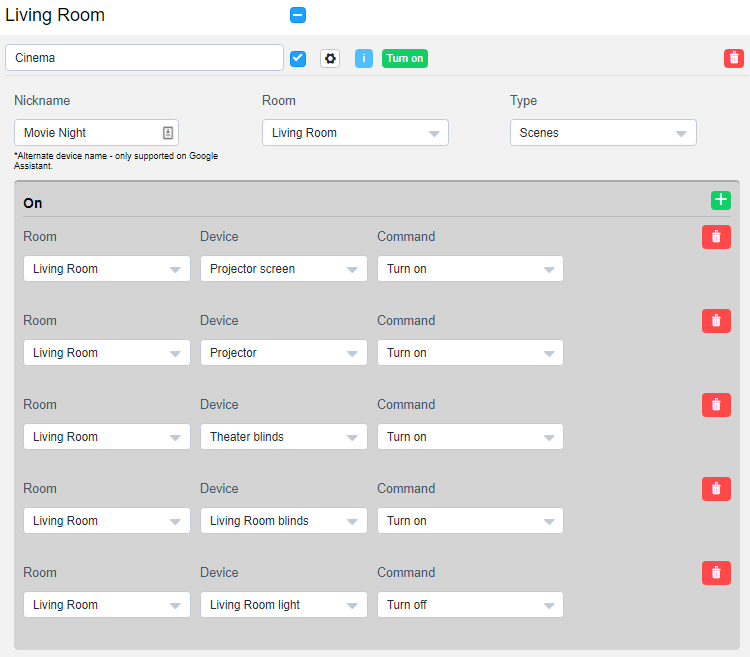 In this article you can find tutorials for setting various typical scenes with 1Home Cloud and Box and invoke them on your KNX, Loxone or other Smart Homes. Virtual scenes are great if you want to control multiple devices: lights, blinds and other controls. We’re going to take a look at creating the following scenes: “Welcome”, “Cinema”, “Spa”. 3. Please click on the drop down menu called Room and select “Entrance”. This will show your virtual scene in the “Entrance” section. If you would change it to something else, for example “Living Room”, “Hall” or “Other”, it would be shown there. 5. Let’s start adding devices to the “On” command. We’re going to turn on the Hall lights and Kitchen lights, while putting the blinds up in the Hall and Dining room. Select “Hall”, select Device “Hall light” and command “Turn on”. Select “Hall”, select Device “Hall blinds” and command “Turn on”. Select “Dining room”, select Device “Dining room blinds” and command “Turn on”. 6. Now you can use the command “Home ON” to start this scene. 7. To create an even simpler voice command like “Alexa, I am home” or “Alexa, I’m back” setup a Routine with Amazon Alexa or a Shortcut with Google Assistant for this scene. Read our blog post to learn how to create routines. 8. Great job, now everytime you come home and say “I am Home”, your house will provide a warm welcome. 5. Let’s start adding devices to the “On” command. We’re going to turn on the projector and projector screen, while closing the theater and windows blinds and turning the living room lights off. Select “Living Room”, set Device to “Projector screen” and command to “Turn on”. Select “Living Room”, select Device “Projector” and command “Turn on”. Select “Living Room”, select Device “Living room blinds” and command “turn on”. Select “Living Room”, select Device “Living room light” and command “turn off”. 6. Good Work! You can now say “Alexa, turn cinema on” and everything will be ready for your entertaining evening. 7. To create an even simpler voice command like “Alexa, movie night” or “Alexa, cinema time” setup a Routine with Amazon Alexa or a Shortcut with Google Assistant for this scene. Read our blog post to learn how to create routines. Our next scene will help you relax after a busy day. Turn the sauna, relaxing music on, almost fully close the blinds, dim and change the color of the ambient lights while turning off other lights in the spa. 3. Please click on the drop down menu called Room and select “Spa”. This will show your virtual scene in the “Spa” section. Select “Spa”, set Device to “Sauna” and command to “Turn on”. Select “Spa”, set Device to “Music” and command to “Turn on”. Select “Spa”, set Device to “Spa Ambient Lights”, command to “Set percentage” and value to “30%”. We are also going to change the color of the ambient lights - to make it more romantic, we are going to select a shade of red/purple. Select “Spa”, set Device to “Spa Ambient Lights”, command to “Set color” and your desired color. Select “Spa”, set Device to “Spa Blinds”, command to “Set percentage” and value to “80%”. Select “Spa”, set Device to “Spa Lights” and command to “Turn off”. 6. Good Work! You can now say “Alexa, turn spa on” and everything will be ready for your relaxing day off. 7. To create an even simpler voice command like “time to relax” setup a Routine with Amazon Alexa or a Shortcut with Google Assistant for this scene. Read our blog post to learn how to create routines. Read more about creating routines. Do you have any questions or suggestions? Please let us know at support@1home.io, contact us via the Chat bubble or book a support call.